A cartoon from Qatar, Hamas, Al–Qaeda or ISIS? Jerusalem, Israel — October 31, 2014 … Reliable sources in the Israel government have revealed that a commercial media group in Qatar have offered to buy the Israel newspaper Haaretz. 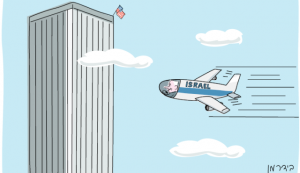 Haaretz, which has a long, documented track record of attacking Israelis, published an editorial cartoon this week evoking the 9/11 attack on the World Trade Center in New York. The cartoon, by Amos Biderman of Haaretz, shows Israeli Prime Minister Benjamin Netanyahu at the controls of an aircraft headed for a building topped by an American flag. The plane says “ISRAEL” on the side. “The message is that Bibi is arrogantly and wantonly destroying Israel’s ties with the US and leading us to a disaster on the scale of 9/11,” Biderman explained in a tweet in Hebrew, according to Haaretz. The cartoon was published amid attacks by the White House in which an unnamed US official reportedly called Netanyahu “chickenshit.” for not weakening Israel’s security. Israelis were enraged with the cartoon but the hatred displayed by Haaretz towards Israel transcended Jerusalem. It directly attacked every Jew from Tel Aviv and London to Paris and New York. The US based Anti-Defamation League demanded an apology. Foxman added that the cartoon feeds conspiracy theories about the Sept. 11, 2001 attacks, which were carried out by al Qaeda terrorists. “On Thursday, Haaretz published a political cartoon that caused a backlash the likes of which make the “chickenshit” story pale in comparison. 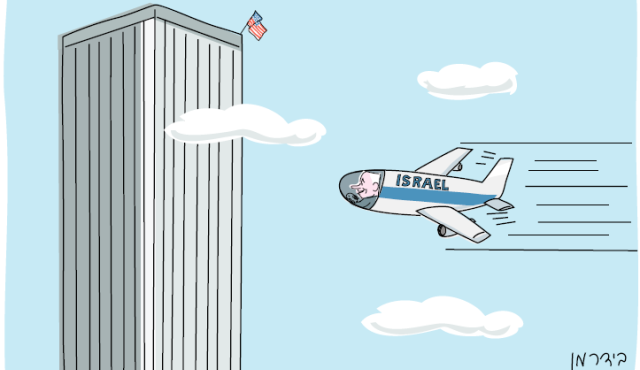 The cartoon depicts Netanyahu flying a plane into the World Trade Center. Not only is it vile in and of itself, but the fact that it appeared while Rabbi Glick remained in critical condition at Shaare Zedek hospital after an assassination attempt made it all the more repugnant. To add insult to injury, cartoonist Amos Biderman defended his drawing. If Qatar does buy Haaretz, one should expect greater circulation of the newspaper in Turkey, Syria, Iran and Saudi Arabia with members of ISIS, Hamas, Islamic Jihad and Al–Qaeda signing up with discounted, Groupon online subscriptions.